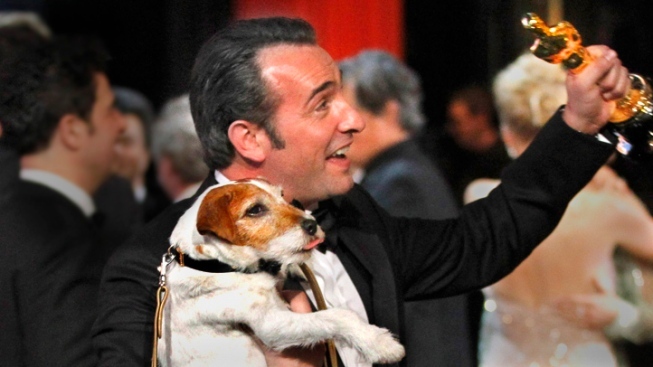 Jean Dujardin holds Uggie and his Oscar statue after accepting the Oscar for best picture. "The Artist," a black-and-white silent film from France, took five big awards at the Oscars Sunday, tying "Hugo" in number of wins but easily dominating the night's conversation and capping off a red-carpet season of success. The team's overjoyed, giddy speeches were among the highlights of an uneven show, in which host Billy Crystal worked hard to make sense of a lot of disparate parts. Earlier in the evening, the film had earned Best Director for Hazanavicius, as well as Best Score, Best Actor and Best Costume Design. Best Actor Jean Dujardin was equally ebullient as he beat out George Clooney of "The Descendants," in what was maybe the only one of the major awards races thought to be in question. Dujardin had previously won Best Actor at Cannes and the Golden Globes, so the win was hardly a surprise. "Thank you! Oui! I love your country. OK. Thank you to the Academy... Thank you, my wonderful partner, Berenice Bejo," said Dujardin. "And if [my 'Artist' character] George Valentin could speak, he'd say: 'Merci! Formidable! Merci beaucoup!'" In a night filled with many predictable moments, the biggest surprise was Meryl Streep's win of Best Actress, an award many thought would go to Viola Davis of "The Help." Streep was honored for her portrayal of former British Prime Minister Margaret Thatcher in "The Iron Lady." "Thank you, thank you. When they called my name, I had this feeling I could hear half of America going, 'Oh, c'mon — her again!' 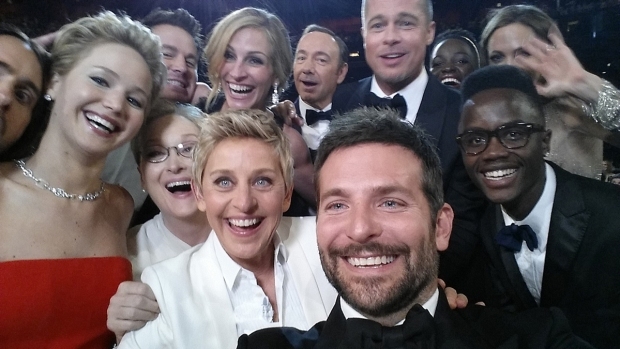 But whatever," chuckled Streep, who paused to embrace Davis on her way to the stage. Streep has been nominated 17 times but hadn't won an Oscar since 1983's for "Sophie's Choice." Favorites Christopher Plummer of "Beginners" and Octavia Spencer of "The Help" won Best Supporting Actor and Actress. "I have to thank my families, my family in Alabama… my 'Help' family… I share this with everybody. Please wrap up, I'm wrapping up. I'm sorry, I'm freaking out!" said Spencer in accepting her award. Plummer won for his work in "Beginners," in which he plays a 70-something man who tells his son that he's gay and has cancer. It was his first Oscar win in a career that goes back to 1953. "You're only two years older than me, darling! Where have you been all my life?" Plummer asked his statuette. "I have a confession to make, when I first emerged from my mother's womb, I was already practicing my acceptance speech." Oscar night is the finale of the traditional red carpet season. Each year the expectations for the big night get higher, yet the audience is harder to maintain. Crystal, hosting for his ninth time, was brought in with the idea of giving audiences what they love. The evening began with an energetic opening montage that put Crystal at the center of many of the major movies up for awards. He sang an opening bit, too. But many interludes between awards featured pre-recorded testimonies about the power of film, or tributes to blockbusters past, rather than comedy from the tried-and-true, if aging, host. Crystal came aboard in November, replacing Eddie Murphy after the show's producing team changed. And Murphy came in to take over where James Franco and Anne Hathaway left off last year, with a show that was designed to attract younger viewers but turned off members of most every generation. "Hugo," the tale of an orphan confronted with a mystery in 1930s Paris, won five awards, including Best Cinematography and Best Visual Effects. Co-writers Nat Faxon, Jim Rash and director Alexander Payne of "The Descendants" won Best Adapted Screenplay for bringing the Kaui Hart Hemmings novel of the same name to the silver screen. Woody Allen won his first Oscar in 25 years, picking up Best Original Screenplay for "Midnight in Paris," but the famed writer-director was not on hand to accept his award, as is his custom. Bret McKenzie, best known as one-half of "Flight of the Conchords," won Best Original Song for the brilliant "Man or Muppet" from "The Muppets." "Undefeated," about an inner-city high school football team in Memphis, took home Best Documentary, and director T.J. Martin was the first winner of the night to get bleeped as well as the first winner of the night to get players off by the orchestra. And, most impressively, he is the first black director ever honored by the Academy. "Someone asked me if this film was for kids, and I said, 'I don't know,'" said Gore Verbinski, the director and co-writer of "Rango," which won Best Animated Feature. The film, which stars the voice of Johnny Depp in the title role, is the story of a chameleon amid an identity crisis. Nat Faxon, Alexander Payne and Jim Rash, "The Descendants"